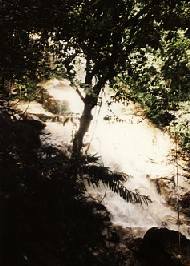 This is one of the 2 waterfalls found in the area. 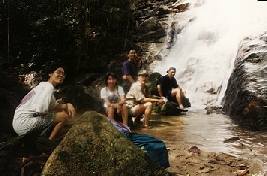 It is hidden in pristine jungle half an hour drive and a long 15 kilometers trek from the KLCC tower. 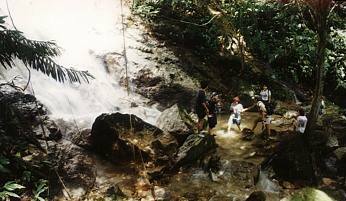 In this place visitors will get to sample the authentic Malaysian Jungle environment. Most suited for those overseas guest with limited time but need to know what this country can offer. Therefore it is never intended for its location to be publicized. Occasionally, Yong did take his Backpackers friends to savor this very tempting ambience . Get some one like him who knows the place. Do not attempt to seek your directions through the myriad faint paths as this is part of the forest that stretches into Gunong Nuang. 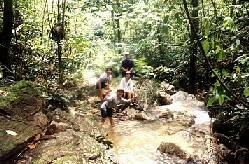 The group found a river crossing to wash up and took a short rest beneath the canopy. Last portion of the way was to make our way through dislodged boulders to reach the waterfalls at the base of a cliff. 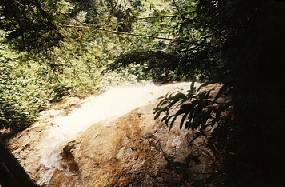 The waterfall, very dramatic is well concealed among the heavy foliage. The bright white colored sheet of water was a sure welcoming sign. An end to those bashings through the seemingly endless forest. Everybody sat there, jubilant and seemed lost in this awfully natural spot. When they regained their composure, back to playing in the cold water. The whole place was rocky and there was not much of a pool. The base was also another narrow ledge where the river immediately rushed pass on its way downhill. Fragment of wall below the ledge had collapsed. The river water just overshoot the top edge, projecting an impression of a near vertical drop to the base. Here a view of that top ledge and from a position of a cliff wall higher than the waterfall. In this photograph, water was flowing from left to right and drop! 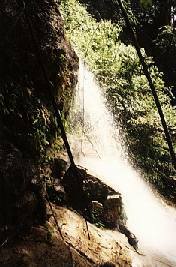 The trekking was wonderful and rewarding. Mushroom, fungi, tree trunks scratched by giant paws and signs of wild boars presence.